The Information Request service provided through SEDL’s two comprehensive centers allows us to provide high-quality evidence to state department of education staff in building their knowledge and capacity to address topics related to implementation of the Elementary and Secondary Education Act and the priorities of the U.S. Department of Education. The Information Request service provided through SEDL’s two comprehensive centers allows us to provide high-quality evidence to state department of education staff in building their knowledge and capacity to address topics related to implementation of the Elementary and Secondary Education Act and the priorities of the U.S. Department of Education. Information Requests provide summaries of applicable evidence-based strategies, approaches, and programs as well as current resources from the regional content centers and various education advocacy, policy, research, and dissemination organizations. 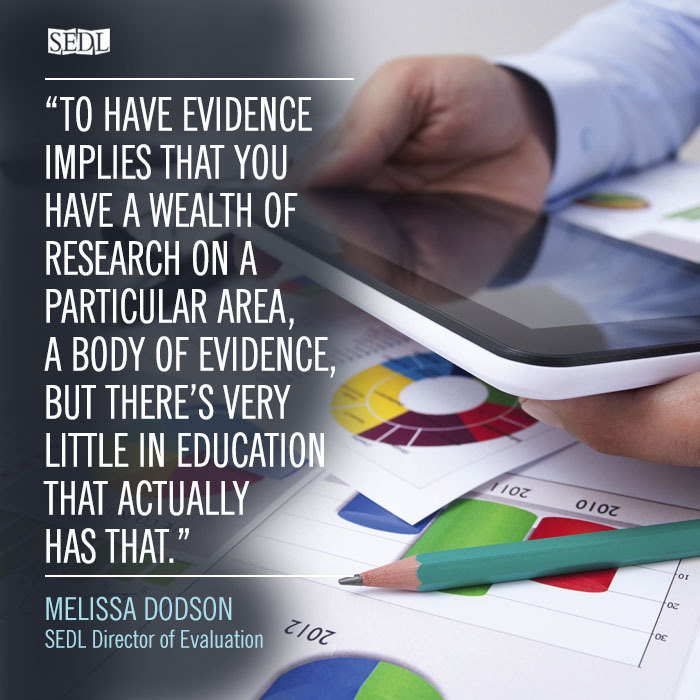 In 2013, SEDL’s Evaluation staff assisted with 16 Information Requests: 14 for the Southeast Comprehensive Center and 2 for the Texas Comprehensive Center. Working with program staff and content experts, SEDL’s evaluators apply a set of standards to every response to make sure the responses are evidence-based and are transparent in terms of disclosing any limitations or weaknesses of the resources as they apply to the audiences who requested the information. This transparency is essential, and it ensures that practitioners and policy makers are aware of the type of evidence available. The levels of evidence range on a continuum from anecdotal evidence to rigorous research, and each type of evidence is valuable to different stakeholders in the field of education. The information provided in the response is used by state boards of education and other decision makers as they set education policies for their states. One Information Request that SEDL evaluators worked on this year, “Closing Consistently Low-Performing Charter Schools,” included a section on the limitations of the resources used to inform the response, stating that the education field currently “lacks a strong research base around best policies, practices, and criteria for closing consistently low-performing public charter schools.” In the absence of such rigorous data, the response includes resources that provide descriptive information about state-specific practices as well as practices recommended by nonprofit institutions and organizations that provide charter school resources and information. The response also includes an annotated appendix describing every resource used and giving an overview of the type of information that resource provides, including its limitations and weaknesses. The transparency of SEDL’s response allowed the state department of education to make informed decisions in its work on developing performance-based monitoring activities for charter schools. For more information, please contact SEDL’s evaluation director Melissa Dodson at melissa.dodson@sedl.org or at 512-391-6606.